On November 4, 1965, some Vietnamese came across a very strange object that looked as if it had been dropped from the sky. Was it a bomb? Well, it had tail fins and a nose like a bomb. But it was white, and shaped like – a toilet? It was a toilet in fact. 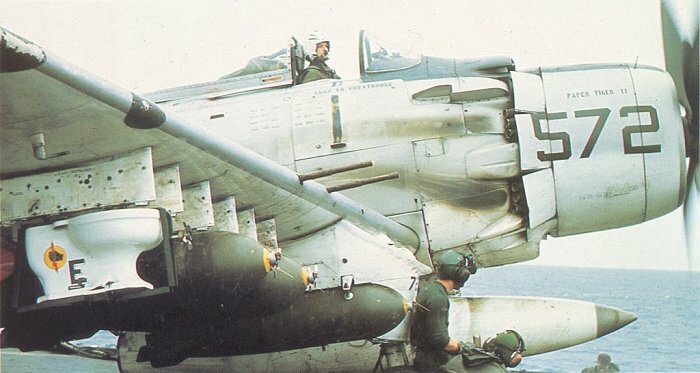 It had been dropped by a VA-25 A-1 Skyraider on a mission to the Mekong Delta in South Vietnam. It had come from Dixie Station, an aircraft carrier base in the South China Sea. The plane’s pilot was CDR Clarence ‘Bill’ Stoddard. As Stoddard approached his target, he began preparations for attack. He read the ordnance (list of weapons the aircraft carried) to Forward Air Control. At the end of the list, he read ‘and one codenamed Operation Sani-flush.’ What was Stoddard talking about? 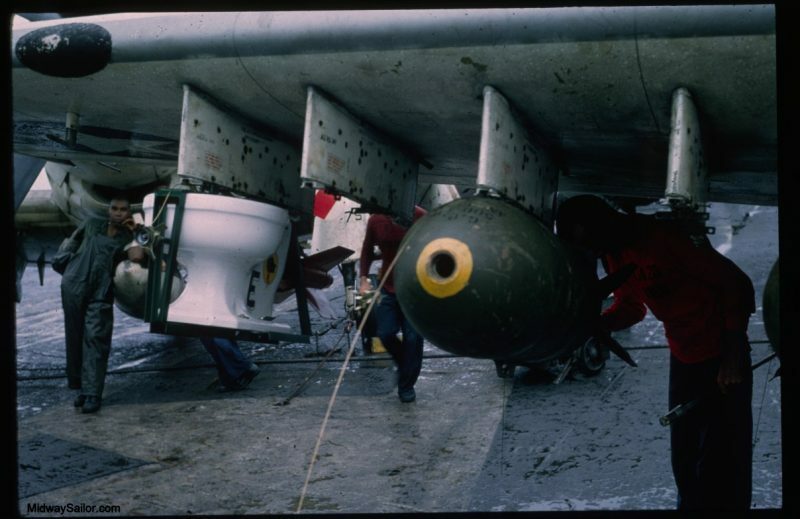 The story of the toilet drop was told by Captain Clint Johnson, the pilot of another VA-25 A-1 Skyraider. 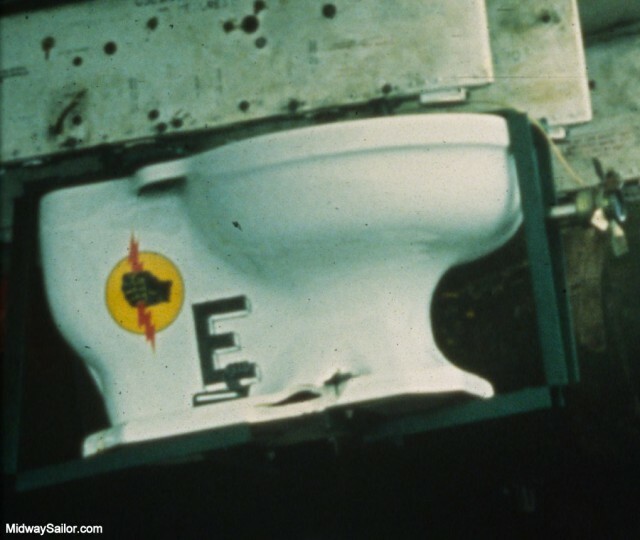 The toilet was a damaged one that was going to be thrown overboard anyway. But some plane captains decided to rescue it, dress it up to look like a bomb, and drop it in commemoration of the 6 million pounds of ordnance that had been dropped by the U.S. Air Force. The Air Control team said it made a whistling sound as it came down, and that it had almost struck the plane as it came off. A film was made of the drop using a video camera mounted on the wing. When the Vietnam War began the Douglas A-1 Skyraider, which had been introduced into the U.S. Air Force in 1946, was still being used. It was a medium attack aircraft based on an aircraft carrier. There were plans to replace the Skyraider with the A-6A Intruder jet-engine attack aircraft. Nevertheless, Skyraiders participated in the naval attack on North Vietnam on 5th August 1964, as part of Operation Pierce Arrow. They struck enemy fuel depots at Vinh, where one Skyraider was damaged, and another was lost. By 1973, all U.S. Skyraiders had been transferred to the South Vietnamese Air Force. The A-6A Intruder replaced it as America’s principal medium attack aircraft. Bill Stoddard Jr. was born in Atlanta 30 January 1927 and graduated from Marist High School in 1944 and from the United States Naval Academy in 1949. CDR Stoddard joined the U.S. Navy in 1944 during World War II. During his 22 years of service, he served in China, four tours in the Korean Conflict and two tours in Vietnam. He received the Distinguished Flying Cross, two Purple Hearts, eight Air Medals and two Navy Commendation Medals with Combat V in addition to numerous service medals and foreign decorations. On 14 September 1966, while Commanding Officer of Attack Squadron 25 embarked on the USS Midway (CVA 41), CDR Clarence William Stoddard, Jr. was leading a two-plane bombing mission over North Vietnam searching for enemy truck convoys. Near the village of Nghi Thiet, his radar detection system warned him of enemy missile activity. He withdrew over the Gulf of Tonkin before his aircraft, an A-1 Skyraider single engine propeller plane, was struck by enemy fire. CDR Stoddard was initially listed as Missing In Action. His status was changed in 1973 to Killed In Action.